This is an image of Comet PanStarrs B taken about 30 minutes after sunset on the night of March 11. 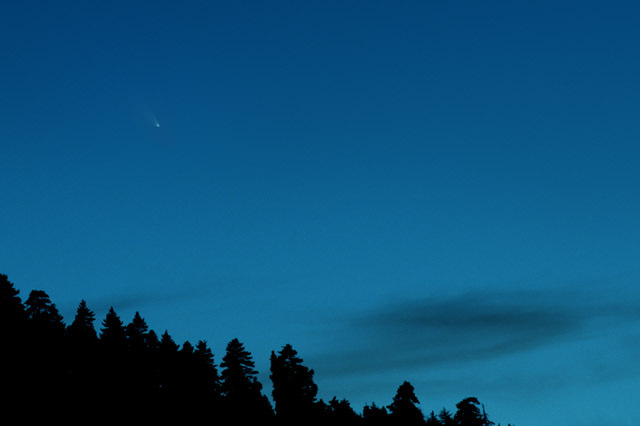 The comet was fairly small and difficult to find. However, once I found it in binoculars, it was quite a pretty site. Software Used Images Plus 4.5 for camera control, Images plus 5.0 for aligning and stacking. Photoshop CS5 for compositing, levels, curves. Gradient Xterminator for gradient removal, FocusMagic for focus restoration. Notes This is only the second comet I've ever imaged - the last one being Halley's Comet in 1986.